Joie de Kitty: Remember the Alamo! As I explained in my post about the missions, the Alamo was one of the five missions established by the Spanish along the San Antonio River. Unlike the other missions, the church at the Alamo remained unfinished (a roof was never put on), and the Spaniards abandoned it in the late 1700s along with the other four missions. At the close of the Mexican War of Independance in 1821, Texas became part of Mexico. A constitution had been drawn up that gave Mexico a federal system of government (based on that of the United States), with each state retaining certain powers (Texas was part of the state Coahuila y Tejas). The new government set up programs to sell land inexpensively in order to attract settlers from the United States. Stephen F. Austin was one of the men in charge of attracting settlers to Texas. Settlers had to agree to give up their US citizenship and become citizens of Mexico, and in return they were able to buy land for much less money than in the US. In 1835, however, General Santa Anna took control of Mexico and scrapped the constitution. His goal was to strip the Mexican states of their rights and centralize the government's power in Mexico City. The majority of the citizens of Texas -- the recent immigrants from the United States and the Tejanos -- were against Santa Anna, and the Texas Revolution began in October 1835. The Battle of Gonzales was the first battle in the Texas Revolution. In October 1835, the Mexican government sent word to the town of Gonzales that the Mexican army was going to come retrieve the cannon that it had lent them for protection against the Indians some years before. The residents of Gonzales decided to fight, and 18 men blocked the Mexican army from crossing the river into the town. The Mexican army retreated, but a few days later they tried to take the cannon once more. This time, the residents of Gonzales rolled the cannon out to the Mexicans. They rose a white flag with a black cannon in the middle and the words "Come and Take It" across the top, and then they fired into the gathering of Mexican soldiers. (Incidentally, I wanted to buy the shirt, but decided against it as the good people of Switzerland would be unfamiliar with the story and might misinterpret the meaning of the slogan...) The soldiers retreated again, and the Texan forces quickly overtook the Mexican army outposts at La Bahia and San Antonio. Incidentally, the army outpost in San Antonio was the Alamo complex. William Travis was the commander of the 200 or so Texan forces stationed at the Alamo in February and March 1836. Also present were Jim Bowie and Davy Crockett (who reportedly said to a fellow Congressman who pleaded with him not to leave Tennessee: "You may go to Hell, but I will go to Texas"), as well as men from all over the United States and even a few from Europe. There were also a freedman named John, who fought for the Texans, a few slaves, and 15 women and children who were family members of some of the soldiers. 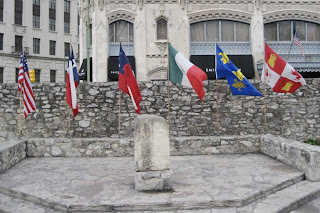 The Mexican army began a siege at the Alamo at the end of February 1836. They flew a red flag, meaning "no quarter", from the top of San Fernando Cathedral (which, sadly, we didn't get to visit because Main Street was completely blocked off for construction). When the forces at the Alamo saw the flag, they responded with a cannon shot. Travis sent messengers out with letters pleading for reinforcements, one of which was famously signed, "Victory or Death!" Legend has it that Travis also drew a line in the sand within the mission walls and asked all the men who wanted to stay and fight to cross it. Supposedly, all but one man did. The siege lasted for thirteen days, ending on the morning of March 6th, when the Battle of the Alamo was fought. Nearly all of the Alamo defenders died in the battle, and those who didn't were executed (you don't want to know how -- I truly wish I had not read the description in the museum explaining what happened) and their bodies were burned on a funeral pyre by the river. 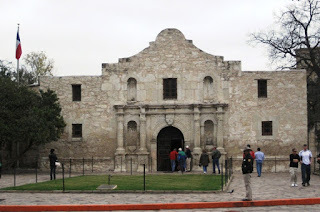 The women and children and a few slaves survived and were sent out by the Mexican army to spread the story of the defeat at the Alamo to the citizens of Texas. The battle became a rallying force for the Texans, inspiring hundreds of men to join the Texan army. Meanwhile, Texas had declared independance from Mexico, although the Texas army was still suffering defeats at the hands of the Mexicans. But at the Battle of San Jacinto, the Texans' luck changed. Santa Anna himself was leading the Mexican army, and the Texans (led by Sam Houston) managed to surprise his forces early on the morning of April 21st. (Legend has it that the Texan forces were able to surprise him because at the time, he was sleeping with a whore called the Yellow Rose of Texas. Which is why, when I used to play such women in the shows at my local theatre, I would wear a yellow rose at my bosom.) The battle cry, of course, was "Remember the Alamo!" The Texans managed to take Santa Anna's army prisoner, and Santa Anna himself was captured the next day. This brought the Texas Revolution to a close. Now, since you've stayed with me through the story, I'll treat you to some pictures.